In case you are looking for a good alternative to your short sleeve shirts, then the long sleeve polo will be your solution. These polos will not only give you a look that is more formal, but can also offer better skin coverage. When it comes to polos, nothing is more functional and timeless. This garment has evolved from being the undergarments that was worn during the 1800s and is now offering classic and functional styles. You can wear these polos in every season without going out of style, as they are particularly useful for outside, they can also be nice and cosy when you are indoors, especially around the winter season. Polos are known for fuss-free designs with short sleeves and a collar. It can be worn by everybody with different sizes and shapes. 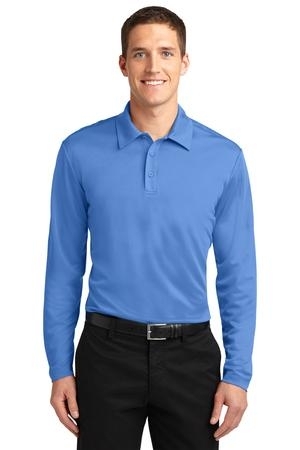 The Port Authority Silk Touch Performance Long Sleeve Polo weighs 3.9 ounces and is made from 100% cationic polyester with a double knit feature. It’s self-fabric, tag-free collar ensures comfortable wear and from this, maximum performance in any walk of life can be obtained. We took our legendary Silk Touch Polo and made it work even harder. The durable Silk Touch Performance Long Sleeve Polo wicks moisture, resists snags and thanks to PosiCharge technology, holds onto its colour for a professional look that lasts. Other features include a 3 button placket with dyed-to-match buttons that yields maximum results to the naked eye. It’s set in, open cuff sleeves gives you a sense of freedom by being able to work and play as hard as you want with plenty of room for air to circulate around the polo. This polo also features a double-needle sleeve cuffs and hem. The Port Authority Silk Touch Performance Long Sleeve Polo enables you to get into touch with your inner self and explore all lost paths in life.